So. Tuesday I was just piffed pipped at the post from making it onto Trashalou's Pay It Forward list (by a certain Mrs Marmadaisy, but its okay, I can live with losing out to someone who knows far too many of my teenage secrets ;)). I was a little disappointed because the whole PIF thing sounds like a whole lot of fun - if only having other people to send my dodgy lovingly made crafty ideas too. I'm pretty sure my kids and relatives are sick of handmade items! Today's prompt for the Learn Something New Class was all about, you've guess it, Pay It Forward. So I thought I would take it as divine providence and set about my own PIF exercise. Here's how it will work. I will send some random crafty handmade-by-me item to the first 3 people who comment on this post. The items will be sent within the next 12 months (I'm not even kidding myself that I would get to them in any less than that, but if they're spaced out over a year I think I can manage it!). When you receive your item you then chose three people to send items that you've made to. Did that make sense? Clear as mud I'm sure! If you fancy joining in then go ahead and leave a comment - but remember you'll need to be willing to make and pass on three items of your own when your PIF item arrives from me. Good plan! On my first ever giveaway no-one responded. How sad! I'll sign up for this, as I am desperately trying to find things to do OTHER than revision. And I think everyone is sick of home made things from me too. Unless you get a squillion responses. OH BUM - looks like I'm too late for this one too!! Ha ha, so you weren't a sad and lonely blogger with no craft friends after all then. Phew!! 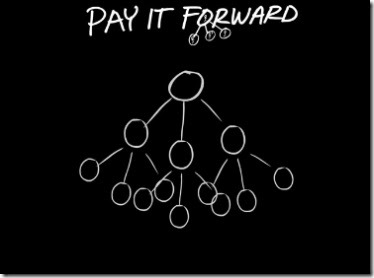 And may I commend you on a very impressive Pay it Forward .... graph? Sketch? Illustration?? It looks very technical. Talking of which .... please don't confound me with techno-speak! What is this RSS feed you speak of? 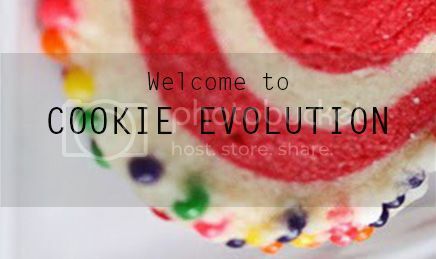 And doesn't my blog already have one?? When I scrolled down to the bottom of my blog page there's a little widget that says RSS 2.0. Is that not it?? Please let that be it! Please don't make me have to do anything complicated and computery!! Drat, I missed my chance to own a one of a kind Marie item. =( Can't wait to see what you make for everyone!